Crumb Cake- I totally OD'd on this on the day I made it. I couldn't stop. It's dangerous. I made this baked meatball recipe that I found on Pinterest a few years ago. I make these every few weeks and they are so good! We have meatball subs or pasta and meatballs and keep them in the freezer too. This was a staple of Carter's diet when he was a toddler. Fiesta Chicken- best Crock pot recipe ever!! (and we ate it 3 nights in a row!) But I have no pictures! Next time I make it I will include a pic and the recipe! Snow days in the past few years too! It's amazing how much more put together I feel when my nails are painted. I love gel manicures because they last sooooo long, but they're not in the budget with time or money so I've been painting my own nails. I stick with neutrals because let's be honest, I'm not that perfectionist about them. A few weeks ago I talked about OPI gel setter and after another application I have to say I'm not impressed. Perhaps it is my terrible technique, but they chipped after 2 days this week. I'll stick with my O.P.I. Nicole top coat and fast drying drops next time. This week I used Essie East Hampton Cottage, but O.P.I. Passion remains my fave. What we've been up to.. Snow, school, playdates, library, baking, trying not to go crazy being snowed in for days and days! On Monday I wrote about our snowy weekend. Business travel! It looks like Christian has 2 trips planned for February and one will be at least a week long to India. Vanilla lattes will be plentiful, for sure! I continue to clean out and donate a ton of stuff. We also listed some things on eBay and that's a little time consuming, but worth it. I also just joined a facebook group for Anthropologie fans to buy and sell Anthro stuff. I may try to sell a few things. And I'm still trying to catch up on printing and putting my collect app pics in an album. I really need to make Reid an album for his first year since Carter has 3 super cute albums for his first year! Liev Shreiber- wow! He's so good and I just remembered that I once rode an elevator with him at my Aveda office in NYC. It's a little racy and at least once an episode I remark to my husband that I can't believe he recommended this to my parents! When it's 6 degrees in the morning I can't even think about anything besides leggings and Uggs. Celebrating my MIL's birthday, a few house projects, and some alone time at Anthropologie and Nordstrom would be lovely too! I was really in need of one- my last warm coat was from Gap like 10 years ago! I'm trying to follow the rule to buy good quality and love it rather than buy a few not so good ones and not really love them. Starbucks is my medication of choice, too! May the starbucks gods be looking out for you when hubby is traveling next month! You had me at the enchiladas! I'm also watching MAFS--what are your thoughts? I think Dave and Ashley won't make it...and Neil and his wife probably won't either. I like the other two tho! Ashley is making us crazy! Dave seems like such a nice guy! What is she doing? And Sam too, ugh! Vanessa and Tres seem like they'll work out! I think the experts need to put some more value into physical appearance since that seems to be a problem this season! I love your blog! What is the name of the Facebook page that resells Anthropology? I love love Anthro, but it is so pricey. 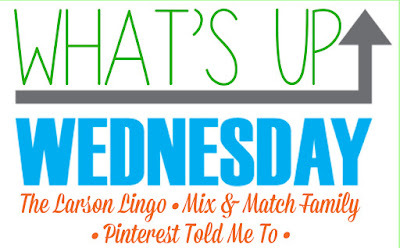 I did What's up Wednesday too! Anthropologie buy, sell, and save is the name of the FB page. There are tons of postings. I don't know the ins and outs of it yet though! Oh Sorry- I typed that wrong---it's Anthropologie buy, sell & trade. Starbucks is so great! My husband and I are just about to finish off a gift card we got at Christmas. Love those coffee treats so much! 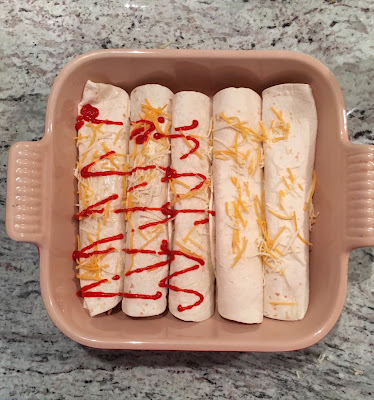 Salsa enchiladas - YUM! We love making any kind of enchiladas! They are soooo easy and quick. Definite winner for our family! Okay, that crumb cake looks delicious! That photo of Reid is adorable! And I got sucked in to Married at First Sight randomly last week, and now I can't quit it! I have to be honest that some episodes drag a bit, but I can't stop watching!!! Last season didn't seem as slow. I'm sure you could catch a marathon of that season!